Al-Nasir Muhammad was a prolific builder who reigned as Sultan of Egypt during three different periods. He built his famous mosque in the Citadel during his third and longest reign (1309 through 1340 AD). 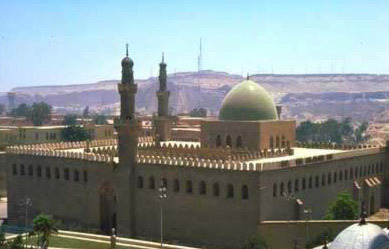 The Mosque of Sultan al-Nasir Muhammad was the royal mosque of both the Citadel and Cairo itself, for it was here that the sultans of Cairo performed their Friday prayers, except on religious feasts, when prayer took place in a large gathering at the hippodrome beneath the Citadel walls. The mosque was large enough to hold as many as five thousand worshippers. The main entrance to the mosque is across the road from the entrance to the courtyard of Muhammad 'Ali's Mosque. From its foundation, the Citadel always had a mosque, and the mosque of Sultan al-Nasir, like most of the buildings he erected at the Citadel, was built on the site of a previous building. 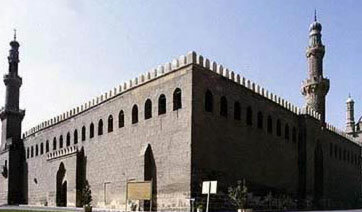 The earlier mosque may have been an Ayyubid congregational mosque, perhaps built by Saladin. There were several mosques within the Citadel, but that of Sultan al-Nasir was one of the most glamorous in Cairo until the original dome covered with green tile over the nine-bay maqsura (a private area in the prayer hall, usually enclosed by a wood screen for the ruler and his entourage) in front of the mihrab, collapsed in the sixteenth century and the marble was carried off by the Ottoman conquerors. According to an inscription on the northern entrance, the mosque was founded in 1318, but Maqrizi in his historical accounts reports that it was pulled down and rebuilt on a larger scale in 1335. However, its masonry shows that it was only built higher, and its roof rebuilt. Traces of the walled-up earlier crenellation on the exterior indicate where the original level was. This hypostyle mosque is built as a regular free-standing rectangle around a courtyard with a large dome covering the prayer niche area. There are three entrances, including one on the northeastern side with a trilobed shallow recess and another on the northwestern wall with a stalactite portal. The third entrance is on the southern wall and is adorned with a pointed arch including a sun-rise motif in ablaq masonry. None of the entrances has a maksala or bench, making them the exception to the rule in Cairo. Unlike many other mosques of the city, with the exception of al-Zahir Baybars, the facades of this mosque are not paneled and have no decoration except crenellation. Its appearance is rather austere except for the two exotic minarets at the northeast corner and at the northwest portal, which are decorated with blue and green faience mosaics. The minaret to the north directed its call to prayer to the officers and soldiers dwelling there. The other minaret faced the sultans' palaces. The northern minaret is the taller of the two, probably so that it could be seen by the palace residence some distance away. Both minarets are built entirely of stone. The western minaret is conical, with a shaft carved in a deep zigzag motif that is vertical on the first story and horizontal on the second. These zigzag motifs make their first appearance around the shafts of Egyptian minarets at this mosque. Its top is unique in Cairo. It has no openings and has a garlic-shaped bulb resting on a ribbed, tapered cylinder. 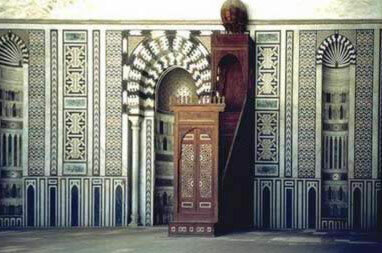 The whole upper structure is covered with green, white and blue faience mosaics like those found at al-Nasir's sabil attached to the madrasa built by his father, Qalawun. A Quranic inscription band made of white faience mosaic adorns the nick of the bulb. This minaret continues the Cairene tradition of placing minarets at the portals of foundations. Its location at the western portal, which was the ceremonial entrance facing the sultan's apartments, accounts for the distinguishing of its shafts from those of the northeastern minaret. The minaret at the northeastern corner of the mosque has a completely different shape. The base is rectangular and the second story is cylindrical. Both are without carving. Its upper part has an open hexagonal pavilion that supports the top of the structure, which is similar to the top of the western minaret. Both minarets have balconies adorned with parapets made of stone panels pierced with arabesques and carved in the same technique used to make the screens of Sanjar. 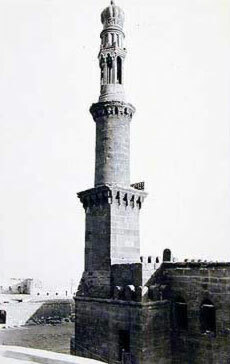 The crenellation around the base of the bulbous top of this minaret is the earliest known experimentation with this technique at the base of a Cairene dome. It is reported that a craftsman from Tabriz came to Cairo during the reign of al-Nasir Muhammad and that it was he who built other minarets covered with faience, as was the fashion in Persia. Not only the faience mosaic technique, but also the bulb shape, seem to have come from Tabriz. We know from a miniature thirteenth century painting that garlic-shaped minaret bulbs adorned mosques in the city of Tabriz. 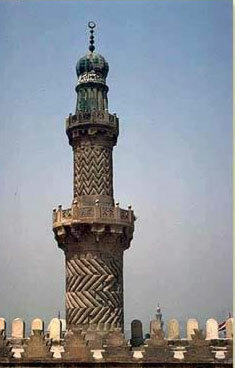 Both minarets also have another common feature that distinguish them from all other Mamluk minarets. Their base is below the level of the roof of the mosque. This indicates that when the roof of the mosque was rebuilt after the walls were made higher, the minarets were already standing. Note that on the northern wall of the mosque underneath the minaret is a small balcony reached by a staircase inside the mosque. Its function is unknown, but one may speculate that it was intended for prayers or recitations addressed to overflow crowds of worshipers outside the mosque. 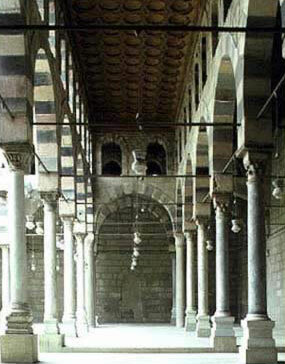 The interior of the mosque follows the hypostyle scheme with the standard pattern of a rectangular courtyard, a sanctuary on the qibla side and arcades surrounding its other three sides. Within the mosque, the walls supported by the arcades have a row of arched windows that give the building a special character. These windows must have been added when the roof was raised. The openings help reduce the thrust carried by the arches, admit light and are ornamental as well. 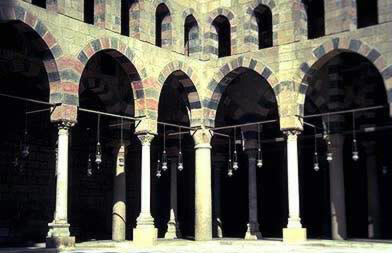 The voussoirs of the mosque's arcades are composed of ablaq masonry of the same stone, but painted. 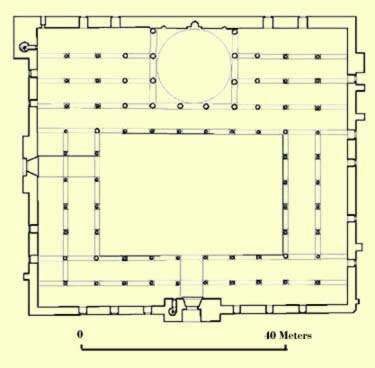 The ceiling over the arcades is flat and coffered with traces of its light blue and silver decorations still visible. The crenellation around the courtyard is of the stepped type, differing from the outer crenellation composed of rectangles with rounded tops like those of the city and Citadel walls. At the corners near the crenellations of the courtyard are four decorative structures similar to the mabkhara (incense burner) minaret tops. A special collection of pre-Islamic capitals crowns the marble columns of the mosque. The two pairs of Coptic Christian capitals at the main entrance are particularly interesting. Their white marble is carved with a basket pattern. However, there are also capitals dating to the Greek and Roman periods. The ground level inside the Citadel has risen, and the mosque must have originally been at a much higher level and reached by a staircase. Following the example of al-Zahir Baybars' mosque, there is a dome above the prayer niche, though this one is much smaller and was covered with green tile. The present dome is modern. The dome is carried by granite columns like those of the Citadel palaces. These columns were taken from ancient Egyptian temples. As the transition zone is made of wood, we may assume that the original dome, like many others in Cairo, was made of plastered wood. The transition zone consists of pendentives carved with stalactites. They, together with the inscription band referring to the founder, were painted and gilded. During the later Mamluk period, we find that stalactite squinches were supplanted by stalactite pendentives. Pendentives are triangles at the corners of the transitional zone of a dome that transfer the thrust of the dome to the corners of the four walls. The squinches are arches or quarter-domes that transfer the thrust into the middle of each of the four walls. When pendentives were adopted, the transitional zone no longer had the appearance of an uninterrupted ring of niches, as is seen in earlier domes. In the absence of squinches, not niches were used in the transitional zone, and windows were no longer divided to resemble pierced niches. A new, arched style of windows then appears. 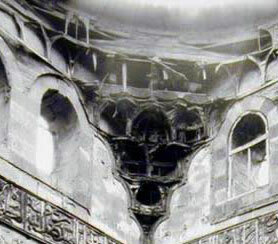 In al-Nasir's mosque, three arched windows alternate with each pendentive. Al-Nasir Muhammad's mosque has another interesting feature, consisting of a small loggia located above the northwestern entrance, reached by the staircase that leads to the roof. It is perhaps a dikkat al-muballigh, like the bench on columns in the sanctuary of other mosques that is used for call to prayer, recitations and Quran readings.